IMPORTANT: Before starting to download Doceri, make sure that Java on the machine is fully updated. On a Mac, click on the Apple icon in the upper left corner and select Software Update. Follow the instructions on your screen to update everything necessary. 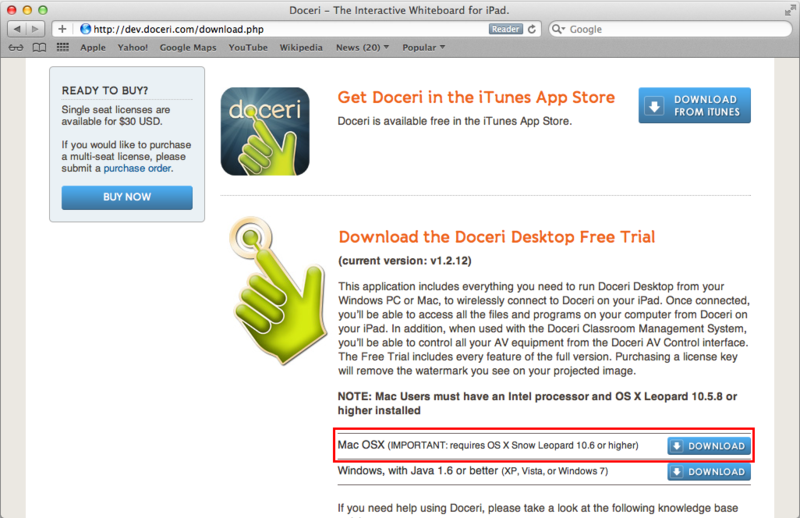 Follow the steps below to download Doceri Desktop, install the application and set your preferences. More information on how to use Doceri can be found in our Help Documents and User Guides. 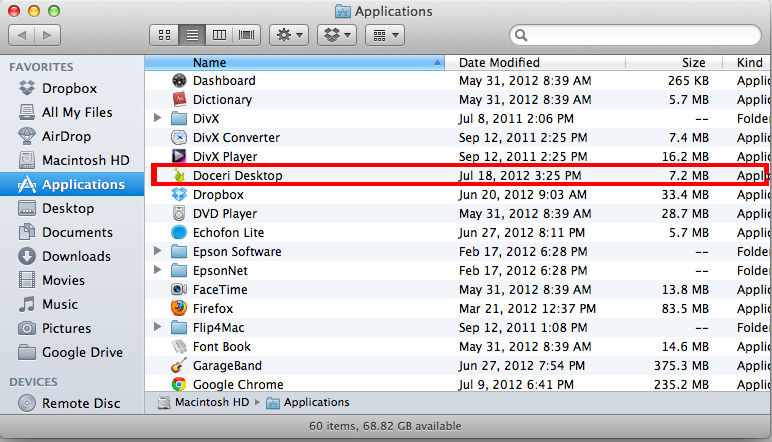 IMPORTANT: You must have Mac OS X Snow Leopard (10.6) or higher to use Doceri Desktop for Mac. First, go to the Download page. Enter your e-mail address and select Download for your appropriate Operating System (Windows or Mac). In Safari, your download should begin automatically. In Firefox, a pop-up window will appear to download the file. Select "Save File" and click "OK". (Your downloaded files will be stored in your Downloads folder unless you have specified otherwise in your browser preferences). Note: If the pop-up window does not automatically appear, in Safari to the right of the address bar, a little button with an arrow pointing down will appear when a download finishes or is taking place. Clicking on this button will show completed downloads. Locate the zipped folder and double-click to extract. 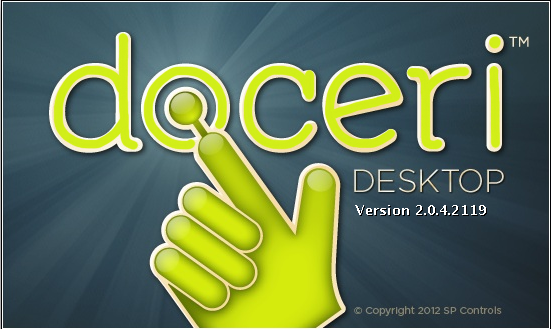 A Doceri Desktop icon should appear on your desktop, double-click it to open. 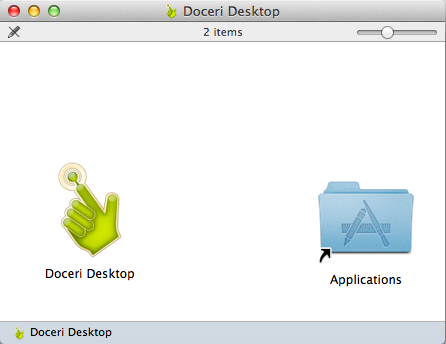 Drag the Doceri Desktop icon over the Applications icon to copy Doceri into your Applications folder. Locate Doceri in your Applications folder and double-click to start Doceri. 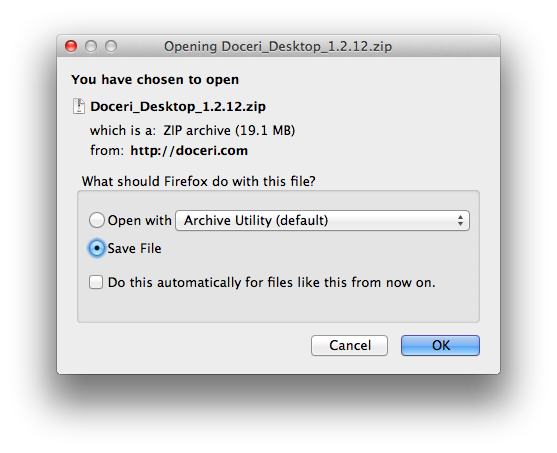 A pop-up window will appear asking if you wish to open the Doceri Desktop application which was downloaded from the Internet. Click Open. OPTIONAL: You may drag the Doceri icon from your applications folder to your dock for easy access. Doceri Desktop will begin to launch on your computer. 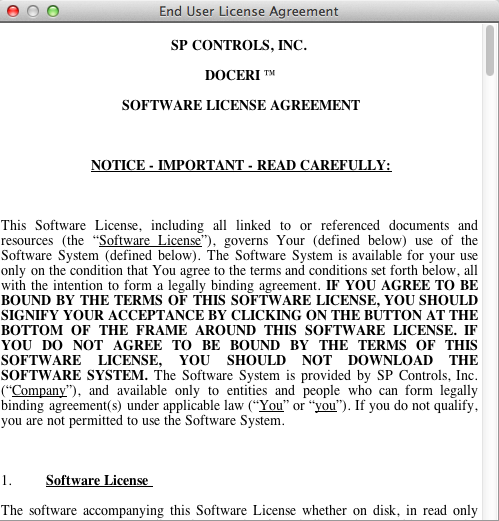 The first time you run Doceri on your computer, you will be asked to read and accept the Doceri Software License Agreement. A window will appear prompting you to set a password for connecting Doceri Remote on the iPad to Doceri Desktop on your computer. 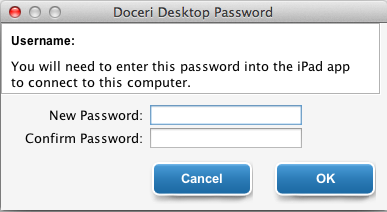 Make a note of your username in this window and the password in order to make the connection between Doceri Remote and Doceri Desktop. If this window does not appear automatically, click the hand icon in the top toolbar and select Settings and choose the Password tab to edit the password options. Note: The "username" is your user name on your computer. It does not have any relation to the username and password you created at www.doceri.com. After setting your password, a Doceri hand icon will appear in the upper right or your top menu bar. Click on the hand icon to access the drop-down menu.